Yang Chengfu (1883-1936) modified and opened to the Chinese public the formerly held secret Yang Family Style Taijiquan (tai chi). His descendants, as well as his students and their students have made Yang Style Taijiquan the most popular and practiced taijiquan in the world today. Yang Chengfu (also named Yang Zhao Qing) was the grandson of the founder of Yang Family Taijiquan, Yang Lu Chan (1799-1872), and the son of 2nd generation Yang Tai Chi master, Yang Chien Hou (1839-1917). His father taught him some of the basics of Yang combat training, but as a young man he cared more about drinking and womanizing. After his father's death in 1917 he became more interested in the martial arts and began serious studies with his older brother Shao Hou and other members of the Yang family. 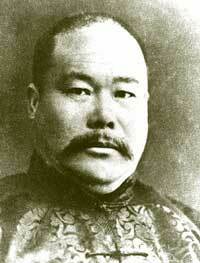 He publically taught taijiquan at the Beijing Physical Culture Research Institute from 1914 until 1928. He moved to Shanghai in 1928 and continued his teaching. 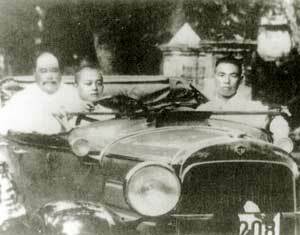 Yang Chengfu dominates the back seat of this roadster in Hongzhou, China (circa 1930). Chou Bin (Zhao Bin), Fu Zhong Wen's brother- in-law, is the front seat passenger, and Zhou Tien Sou Lin, a family member who helped Chengfu with the poses in his applications book, is the driver. Chengfu style: Yang Chengfu developed a system of taijiquan that differed from that of this father, uncles and grandfather. He reduced or eliminated many of the difficult high kicks, leaps and stomps, replacing them with wider more comfortable stances with smoother flowing, light, agile, rooted movements; thereby making taijiquan more accessible to the general public. Nevertheless his style was strict and demanding—some say he even created a more effective martial art. He called his style Yang Big [or Large] Frame (Yang Da Jia). Pictures and text of him performing his taijiquan are found in the book The Essence and Applications of Taijiquan, translated by Louis Swaim. Comments: There is no one standardized Yang Chengfu style. He even over time made changes and adjustments to what he practiced and taught. For example, as he grew older he made the forms easier to practice and more emphasized their health benefits. Today it may seem that there are nearly as many versions of Yang Style Taijiquan as there are instructors. However, although the many versions differ as to exact executions of the movements, what has remained is that the movements themselves are generally recognizable as being part of his Yang Style Taijiquan. This video therefore may be the closest thing to actually seeing Yang Chengfu performing his style of taijiquan: Yang Zhenduo and Fu Zhongwen Taijiquan (Tai Chi). Biographical Profiles of Tai Chi Chuan Masters: Yang Cheng Fu. Yang Chengfu. The Essence and Applications of Taijiquan, translated by Louis Swaim. Blue Snake Books, 2005. Dr. Yang, Jwing-Ming. History of Yang Style Taijiquan (Tai Chi Chuan).